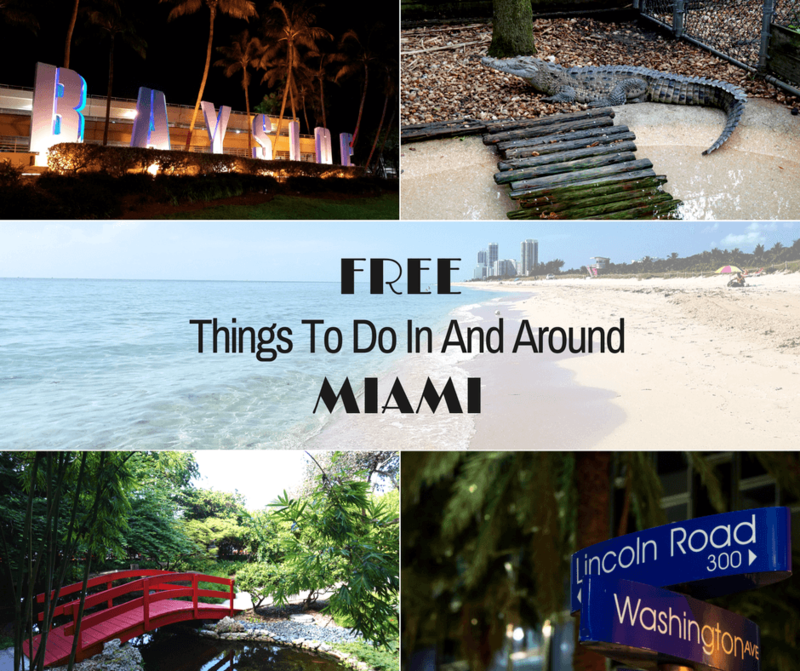 This list of free things to do in Miami will ensure your visit to The Magic City doesn’t break the bank! There are plenty of attractions for kids and adults! One of our favorite free things to do in Miami is walk around the Wynwood neighborhood. The street art is amazing and always changing, so you can go back and see different murals each time. During our last visit to see Wynwood’s latest street art, we did a combination of both walking and pulling the car over to take pictures of our favorite murals. It’s fun to roam and discover new paintings. And don’t be surprised if you see a photo shoot going on; they’re pretty common in this neighborhood. A fun place to visit, day or night, is the Bayside Marketplace. Here you’ll find shops, restaurants, and plenty of live music (and yes, people dance!). We love going there to walk around, soak in the energy, and people watch. We also like to go and imagine which boat or yacht could possibly be ours one day lol! *You do have to pay to park in the adjacent parking lot. Up the street from Bayside is the Perez Art Museum. This sleekly designed waterfront museum features modern and contemporary art from the 20th and 21st centuries. Admission is $16, however, admission is free every Second Saturday of the month and every First Thursday of the month. The museum also offers multiple free tours led by museum guides in both English and Spanish, so be sure to check out their website for updated tour times. We took advantage of that free admission and spent a couple of hours wandering around the museum on a second Saturday. Our favorite piece was “Mar Invadido” (Invaded Sea) by Tony Capellan of the Dominican Republic. It calls attention to the ever-increasing pollution of our oceans. All of the objects used to create the piece, that resembles a view of the sea, were collected in the waters of the Caribbean. The Biltmore Hotel is a National Historic Landmark inspired by a cathedral in Seville, Spain. Built in the 1920’s, this iconic hotel has an interesting history. It welcomed guests such as Judy Garland, Bing Crosby, Franklin D. Roosevelt, and Al Capone and held events such as fashion shows, galas, and aquatic shows (it has the largest hotel pool in the continental US). For those that would like to see the magnificent hotel and learn more about it, a free tour is given every Sunday at 1:30pm and 2:30pm. The tour starts in front of the concierge desk in the main lobby and lasts about one hour. If you’re in the Homestead area, stop by Wat Buddharangsi of Miami. This Thai Buddhist Temple is a great place to enjoy some peace and quiet and admire the many Buddha statues. They often hold events or classes there as well, and we sat in and watched a class that was being held on meditation. The amount of monks on the property varies depending on the time of year and if there are ceremonies being held, but there are a few that reside there at the temple. It’s not very big, but if you’re in the area visiting Coral Castle or any of the many farms or gardens in Homestead we definitely recommend stopping by. Another fun place to walk and people watch, day or night, is Lincoln Road. The mile long pedestrian-only street in Miami Beach has shops, restaurants, cafes, galleries, and street vendors. You’ll find locals and tourists alike enjoying the great weather and fun atmosphere. In the heart of urban Miami Beach, visitors can find the beautiful greenspace of the Miami Beach Botanical Garden. Admission is free (they’re closed on Mondays though) and they have a self-guided tour system that allows visitors to learn about the various plants and the natural history of Miami Beach. One of our favorite areas was the Japanese Garden. *There is street parking around, or you can park a couple of blocks away at the 17th St. Parking lot. Next to the botanical gardens, is the very stirring Holocaust Memorial. We think it’s important to not only have fun, but also to get to know the history of a new place. With South Florida having one of the highest populations of Holocaust survivors in the United States, it made sense to build a monument here commemorating the six million Jews who were killed by the Nazis. South Florida has stunning beaches, so you should definitely take advantage and spend some time on the sand. The South Beach area is fun and you can see some pretty beautiful people, but if you want an area that’s a bit less crowded and has more of a local feel, head over to North Shore Open Space Park on Collins and 85th St. It’s our personal favorite and we’ve spent many weekends there. But whatever beach you end up at, we’re sure you’ll enjoy yourself. While you’re in Miami there’s a good chance that you’ll also be spending time up north in Orlando. If that’s the case, we recommend stopping by Busch Wildlife Sanctuary. It’s in the city of Jupiter, just off of the Florida Turnpike and I-95 so it’s easy to get to while traveling between Miami and Orlando. This unique animal sanctuary is both a nature center and a wildlife hospital, so visitors get to see a lot of animals that are native to the area including alligators and panthers. Their mission is to rehabilitate injured animals and also to educate visitors on the local wildlife and environment. The sanctuary also has trails through cypress wetlands and different fun activities held throughout the week like feedings and animal educational programs. – Although admission is free, some of the places listed would appreciate a small donation. – Many areas around Miami have metered parking, but you can pay for most of them by downloading the appropriate app. They are a convenient way to pay and they’ll send you text reminders when your time is almost up. – If you’re worried about parking or driving, we recommend using Uber. For more helpful tips, read our Related Posts below! My MIL lives about an hour from Miami, so find ourselves there sometime with nothing to do but head to a beach. This is a great list. I am a huge fan of street art, so that will be my first stop. Also, I didn’t know that holocaust memorial was in Maimi. I’ve never been to Miami but this makes it look incredible! I would love to go sometime. It’s impressive there’s so much to see and do for free there but I would probably never leave the beach! Thank you for this list. Not only is it good to save once in a while in city as expensive as Miami but — granted I’ve never visited the city — had you just shown me the pictures I would have not thought that half of those were taken in Miami! So thank you for changing my perspective! Hi Meg! Yeah, we could have easily spent all day at the Biltmore lol. Wow, what a great list. So many cool things to do and all for free! That street art is gorgeous, so many photo opps. Touring the Biltmore would be fun. I’ll have to remember they offer tours the next time I’m in that area. The Biltmore hotel looks fantastic, I’d love to have dinner there but what I really thought was awesome aside from the street art was that hand sculpture. Gives me goosebumps. I have an Aunt and cousin in Miami….I think I’m long over do for a visit heehee. Thanks for outlining all the free things we can take advantage of in Miami! I would love to check out Wynwood myself – I’ve seen so many cool street art lately online! I wonder why there’s a Thai Buddhist temple in the city, are there a lot of Thai living in Miami? I never knew that Miami had so much variety. I’d love to go and see the Biltmore Hotel myself. It took me awhile to realise that you weren’t joking and that this is in Miami!! I’d probably end up distracted looking for turtles at the Botanical gardens! Awesome and right on time, we are leaving Germany for Florida in 4 weeks! We will have to hit up Lincoln road, the Holocaust Museum and of course the beach! Looks Fabulous! A lot to see and do for free. There are a couple places that I would visit for sure including the Busch Wildlife Sanctuary, Botanical Garden, Biltmore Hotel and definitely take a stroll around the Bayside Marketplace. Wow, I haven’t been to Miami in years and I feel like it’s time for another trip to see all of this. I always think of Miami in terms of the beach but obviously there’s so much more to do. This is a great list – especially because these things are free! The street art is really creative and it’s not just some random doodles, they do have a meaning portrayed beautifully by the artists. The glitter of Bayside warmed my heart! The Buddhist temple looks amazing and just walking through that beautifully lit Lincoln road can give you pleasure. As it is rightly said, ‘The best things in life are always free’. So many great ideas! I had no idea there was a Holocaust memorial, but that looks particularly moving. I hope to visit it one day. Miami is a dream destination for me, Buddy! I’m happy to hear that there are so many free things there!